Sulfur tube is the accumulation of sulfur in ear canal, which seal the lumen. Sometimes tube consists predominantly of closeplease epidermis - epidermal tube. Symptoms - lowering hearing impairment, noise in the ear, autophone (the patient feels the resonance of his voice in the ear). These symptoms usually suddenly, often when hit in the ear of water. The direction of the water jet (arrow) in the washing ear. Remove sulfur tube washing with the help of a syringe Jean weak (pink color) by the solution of potassium permanganate, of rivanol, water, warmed up to the temperature of 37 degrees. A jet of fluid is directed along the rear-upper wall of the ear (Fig. 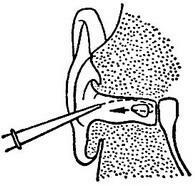 ), pull the ear backwards and upwards (to straighten the ear canal). Below ear substitute kidney-shaped basin. If you remove sulfur tube washing failed, appoint softening drops in the ear, such as when sulfur traffic Rp. : Natrii hydrocarbonici 0,5, Glycerini, Aq. destill. aa 5,0. M. D. S. 6-8 drops 2 times a day warmed in the ear canal. After washing, you must dry the ear canal and smear its walls indifferent ointment. Before washing must find out whether the patient sickness from the ear (there may be perforation of the eardrum). In such cases, the washing contraindicated and brimstone tube is removed using a blunt hook under the control of obligatory medical specialist.